Born at Emerson on 30 July 1893, daughter of William John Garton and Laura Elizabeth Nash (1860-1951), and sister of Maris Henry Garton, she accompanied the family to Winnipeg where they took up residence on College Avenue by 1911. She attended St. John’s College and married Edwin Hamnett Baird Hanbury (1892-1985) at St. John's Cathedral on 21 November 1923, with her father performing the ceremony. The couple had a daughter, Laura Constance “Connie” Hanbury (1928-1995, wife of Mr. Gonzales) and son, T. A. “Teddy” Hanbury (b 1932). They initially took up residence at Langton Farm in Morden, residing there through the 1930s. 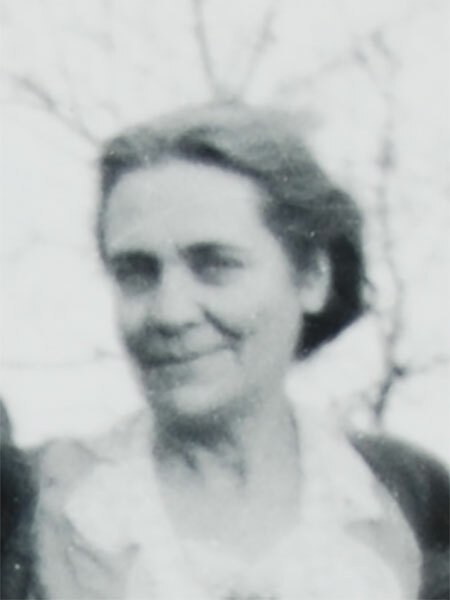 She became a teacher and was the Principal of Wellington School (1942-1943), during which period both of her children attended the school. The family later moved to Vancouver, British Columbia. She died at Normandy Private Hospital in Vancouver on 23 May 1980 and her cremains were interred at Hillside Cemetery. “Music and drama,” Manitoba Free Press, 27 February 1906, page 8 & 12. “[The lady students of St. John's College ...],” Winnipeg Tribune, 5 June 1911, page 9. “List of results in Matriculation [Part II Matriculation],” Manitoba Free Press, 19 June 1911, page 14. “Canon W. Garton,Veteran Anglican Churchman, dies,” Winnipeg Free Press, 28 Jauary 1937, page 3. “Hanbury - Garton,” Winnipeg Tribune, 23 November 1923, page 8. Manitoba School Records Collection, Wellington School No. 59 Daily Registers [1942-1943, registers, personal letter, and photos], GR0347, Archives of Manitoba. Winnipeg estate file PR89-01-16103, Edwin Hamnet Baird Hanbury, Archives of Manitoba. Hillside Cemetery - Morden, Frances Maud Hanbury, BillionGraves.